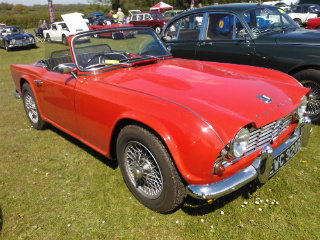 The Triumph TR4 sports car. By the late 1950's, the image of a roadster with cut away doors and side curtains was seen as outdated. 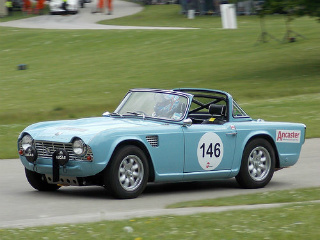 Features such as adjustable facia ventilation and wind up windows were regarded as a necessary requirement in the important, but competitive, US market where the majority of TR4's would be sold. 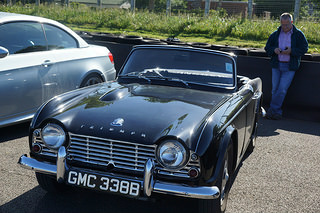 In 1961, the Triumph TR4 was launched. The body was redesigned, with modern styling, by Michelotti who also designed the ill-fated Triumph Italia 2000. 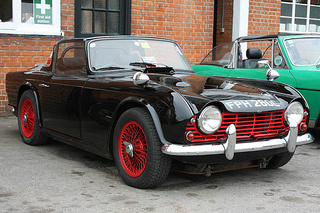 The new body styling no longer used the cutaway doors characteristic of the TR2 and TR3. As a result, wind up windows were now a feature, as was a large capacity boot. An important improvement was a four inch wider track at both front and rear which would help to reduce the problem of over steer experienced in the TR3. Since the height of the body had been reduced, the bonnet incorporated a necessary bulge to provide adequate clearance for the carburettors. The interior was more spacious due to the body being four inches wider. A welcome addition was an air scoop, activated from inside, which allowed fresh air to enter via the facia. 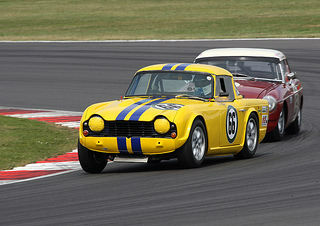 It shared the same chassis and drive train as the TR3B. The worm and peg steering of the TR3 was replaced with rack and pinion. The suspension used coil springs at the front and a live axle at the rear. Initially, two SU carburettors were used, but were replaced with two Strombergs later on. Following on from the TR3A, it used disc brakes at the front and drums on the rear. A particularly unique optional extra was a hardtop with a glass rear window and a detachable centre panel which, when removed, could be replaced by a vinyl insert covering the open top. This insert was referred to as a Surrey top. 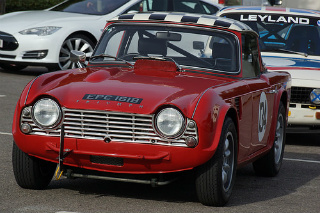 1962 Triumph TR4 Seen at a race meeting at Crystal Palace in 2015 Great! The TR4 used the same 4-cylinder, pushrod operated Ferguson tractor engine, as used in the TR2 and TR3, but with the cylinder bore increased from 1991 cc to 2138 cc. 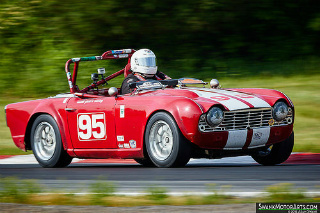 The compression ratio was increased from 8.5:1 in the TR3 to 9.0:1. The TR2 to TR4 were all fitted with wet liners so that the engine's capacity could be easily changed by replacing the cylinder liners and pistons. In this way, a competitor could continue to race under different rules relating to the engine capacity, such as above or below 2 litres. 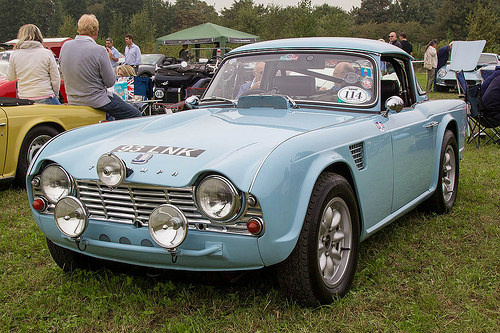 Since the three bearing crankshaft was liable to seize if revved above 6,500 rpm, the TR4's used for racing were fitted with a supercharger, which greatly increased both power and torque at lower revs. 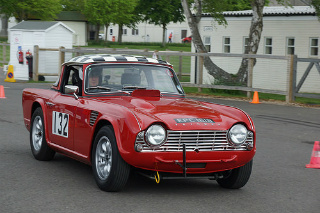 A supercharged and tuned 2.2 litre TR4 engine could produce in excess of 200 bhp, compared with 105 bhp from the basic engine. 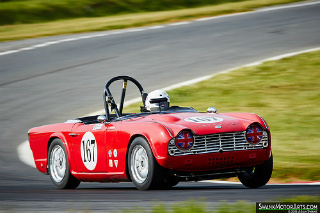 The TR4 used a four speed gearbox with synchromesh on all forward gears. An invaluable optional extra was a Laycock-de-Normanville overdrive which operated on the top three gears by throwing a switch. In effect, this meant that a TR4 would have the equivalent of a manual, seven speed, close ratio gearbox. 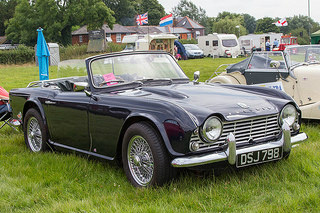 Since, in 1961, Triumph was looking ahead to the advent of 6-cylinder roadsters, then the TR4 was regarded as a transition between the TR2/TR3 era, and the appearance of the TR6 sports car. 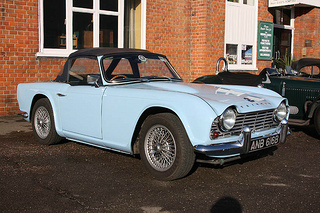 The TR4 established itself as a well respected rally car, in both Europe and the UK, throughout the early and mid 1960's. 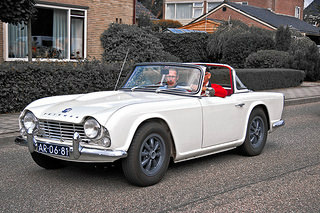 A 1961-65 Triumph TR4 sports car, in good condition, could fetch around £20,000/$32,000, whilst a basically sound example that needed additional work would be worth around £8,000/$13,000.